I have to thank my friend and fellow shooter Bill Barwick for tricking me into going to the match yesterday. I had a last minute change in plans and was able to go to the match but thought it was at 100 yards. Actually, Bill neglected to tell me that it was at 300 yards, Im sure that was intentional. Either way, I went to the match and enjoyed the experience. I definitely struggled with the distance and the conditions but have provided pictures a couple of the targets from the match. The targets are so large, that it is difficult to get the entire target and still have the bullet holes big enough to distinguish. I have provided the pictures anyway and hope that you can see them. The match was at Maineville in Pennsylvania, a long drive to make on a regular basis. I preloaded all of my rounds the night before and was up until 10:00 doing so. Got up at 3:00 am and met Bill at 4:00 for the ride up. We had a nice drive up and even stopped for Breakfast at a diner close to the range. When we got to the range, I was most impressed by the number of benches and the size of the range. I had never even been to a range where there were distances greater than 200 yards, much less prepared to shoot at that distance. Bill and I shared a bench since I dont have any windflags yet. We set out his windflags at a couple of different yardages but only had 3 flags to use. We set up one flag close to the bench to see the effect of the wind up close and then set the other two at 200 and 275. The 2 further flags could be seen in the scope under the target. Bills flags are the type without a daisy wheel and he has 2 ribbons hanging from the vane one light ribbon on the top and one heavier on the bottom. I need to save up and get a nice set of flags for myself. I had no idea on how much elevation I needed to add to my scope for 300 yards. I looked for a shooter on the line that was shooting a PPC with a leupold scope and asked him how many clicks I would need to add in elevation to get me on the target. He gave me a starting point of 10 clicks and I clicked my scope up and was ready to give it a whirl. During the open range, a guy on the bench next to me with a spotting scope (hunter class shooter) volunteered to spot for me to get me sighted in. I shot my first shot with no luck neither of us could see a hole (It turned out later to be low right and in the black). I added 2 more clicks of elevation and got on the target but out to the right. I shot a couple of more shots until I had my scope set for both vertical and horizontal. I then tried to shoot the x and shot an X on my first shot. I couldnt even distinguish the hole from the dot in my scope. The spotter told me to shoot another and then another. I could see the hole getting bigger. He encouraged me to put 2 more in to finish a group. I got the 4th shot in the group and lost the 5th out to the left. 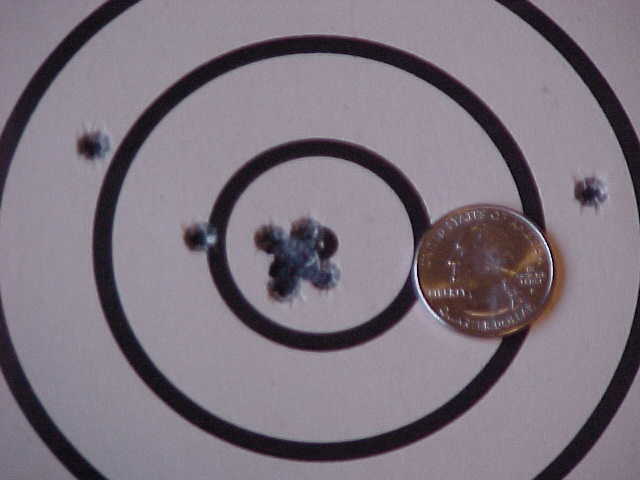 The only regret that I have is that I shot all of my warm-up shots on the same target, but here is the group at 300 yards. 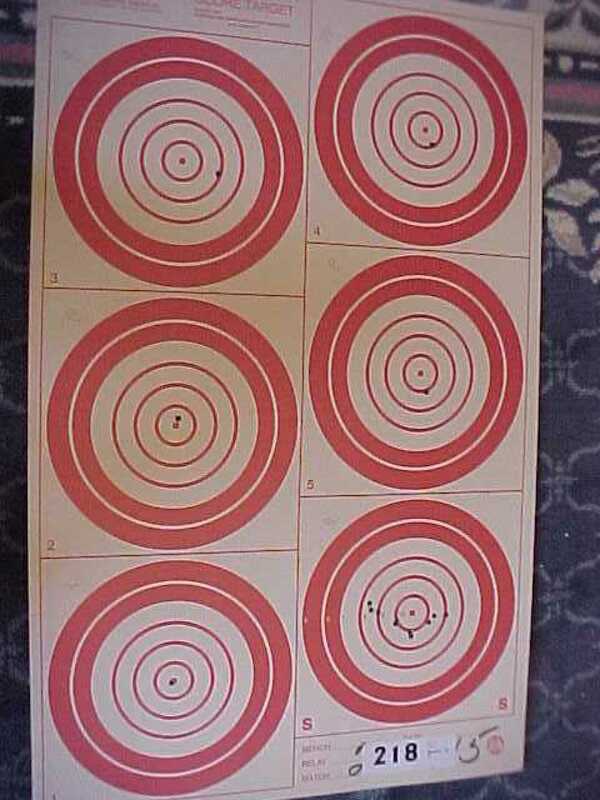 There are four shots in the 10-ring and one a little to the left. That was a confidence builder for me and maybe even gave me a false sense of confidence. I had a good condition that hung around long enough for me to get off 5 shots but was rushing and probably had a gun handling error on the last one. I then shot the warm-up match and ended up with a 48 and no xs. Same thing on my first two matches, I shot 48s again but still no xs. My 3rd match was my personal best and was a 49 and 1x. The picture of that target is shown below. I then followed up that with a lowsy performance in the 4th match which turned out to be a 46 1x. Through the first four matches and the warm-up, the worst targets that I had shot were 9s. In the last match of the day, I shot a 48 with four 10s and an 8. I also picked up an x. I totally missed a switch in the wind and the bullet got blown big time. I was trying to run a condition and had already gotten off 3 nice 10s and an x when I shot the 8. I was disappointed in myself for doing so, but managed to shoot the last target as a 10. I ended up in 8th place out of 13 shooters with a 239 and 3xs. It was a great opportunity for me and probably taught me to appreciate shooting 100 yards. I gained a lot of confidence in my gun and got to see what it was like to shoot 300 yards with the PPC. I had posted all of my targets in this document, but found it to be too large and felt it may cause some people some problems loading. I had intended to put them all on but the targets are so big that I was forced to cut down on the size. Below is a picture of the best target that I had shot all day: 49 1x.